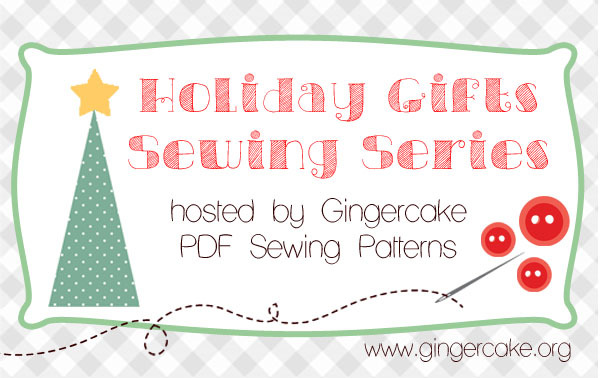 When Virginia of the Gingercake blog + shop emailed to see if we’d be interested in sewing one of her patterns for her Holiday Gifts Sewing Series, it immediately conjured up memories. Every Christmas, my mother tied wide red velvet ribbons around a few stuffed animals and set them in little wooden chairs on either side of our fireplace. They only appeared at Christmastime which made them seem extra special, and my favorite one was a small white puma. I just loved it and every time the boxes ‘o decorations made their way from the attic down to the first floor, I would find it buried somewhere and call it my own- If only for the month of December. So this little guy is staying in the family. I wonder who will call dibs? The girl with the matching pants, of course! Corinne was pretty taken with this bunny. She looked at it for a while, but then began to pick at the button eyes and the floppy bow. She hugged it tightly, threw it on the ground, picked it up, put it in her shopping cart and rolled it around the kitchen… you get the idea. 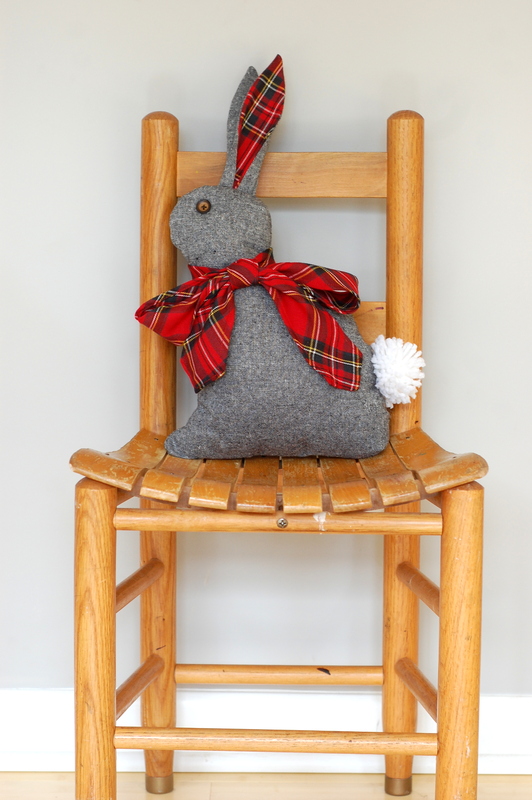 This little bunny takes a nice shape thanks to a couple of well-placed darts and a little boxed corner at the toe. Nice little details that I never would have thought of on my own. The body is made of Essex yarn dyed linen in black. 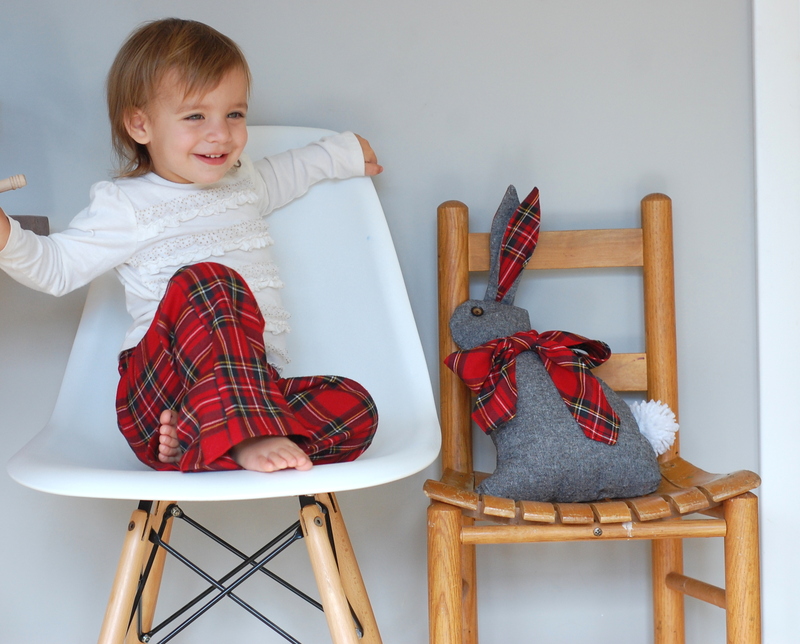 For the ear lining and bow, I used some red tartan that has been burning a hole in my stash for three years. This might be my new favorite fabric combo, fyi. Those bell-bottoms that Coco is wearing, were made for my older girl back when she was a toddler. sniff sniff. I found them the other day in a box of Winter clothes and I knew we had to include them in this photo shoot! My favorite part about making this bunny would have to be that cute pom-pom tail. It was the first one I’ve ever made and I could seriously get hooked! I used a basic white yarn and wrapped it around my hand old-school style- though I’ve heard there are pom-pom makers out there. 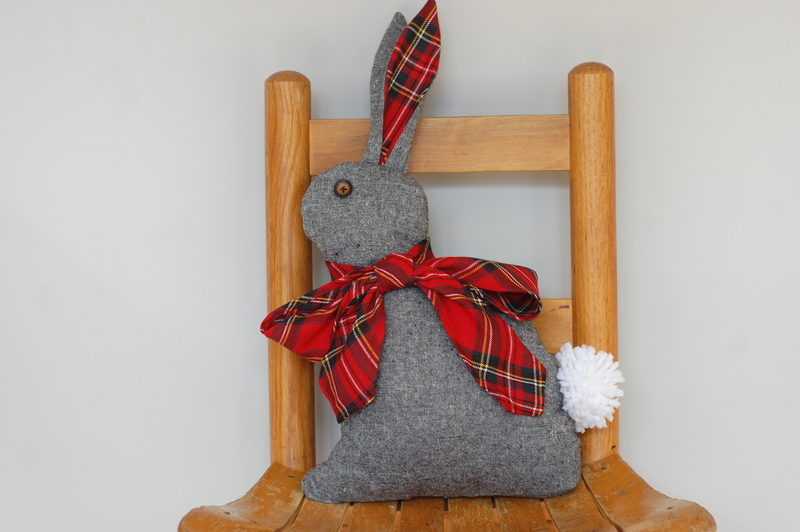 Would you like to make your own folksy bunny? 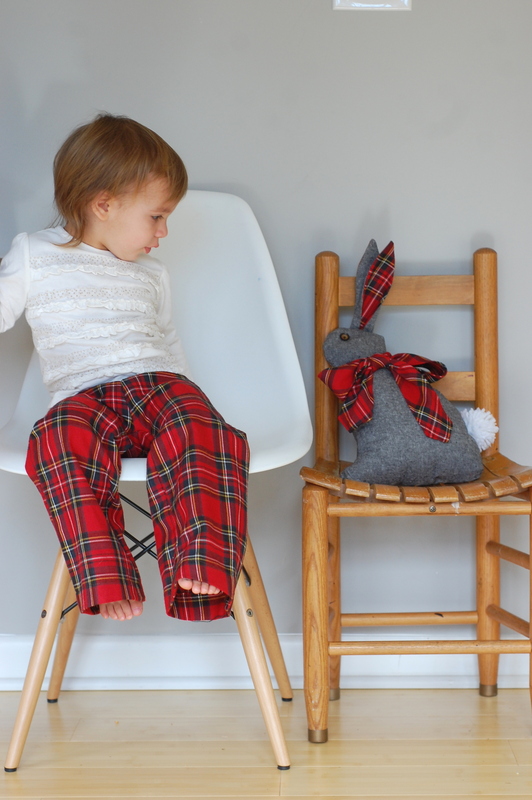 Virginia has kindly offered up one Bunny pattern for one of you cool readers. Giveaway will end on Sunday 11/17 at 9 pm and a winner will be chosen at random. 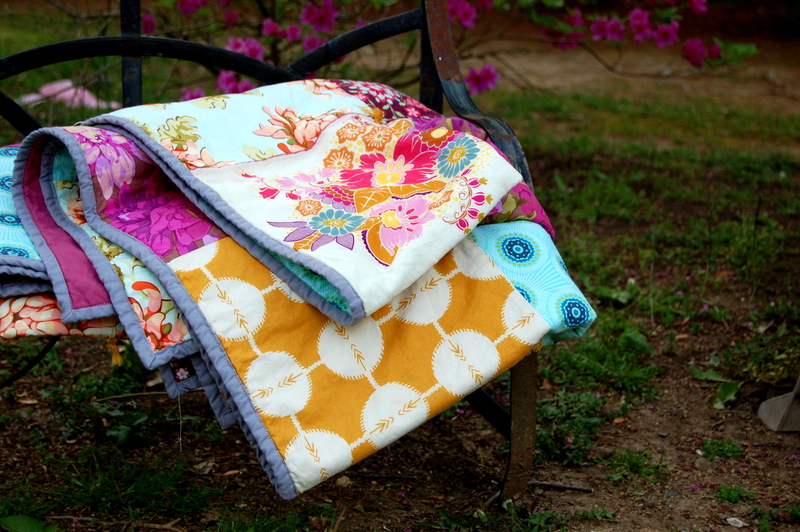 Be sure to check out all the other great PDF patterns in Virginia’s shop– tons of cute stuff there perfect for a handmade gift! p.s. 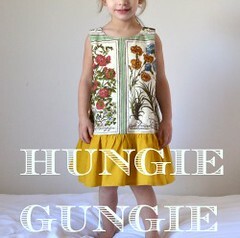 You can *like* Hungie Gungie on FB now and be up to the millisecond on any breaking news we may decide is important to share. j/k. you’ll be lucky if we ever remember to post over there. … hittin’ the big time y’all. 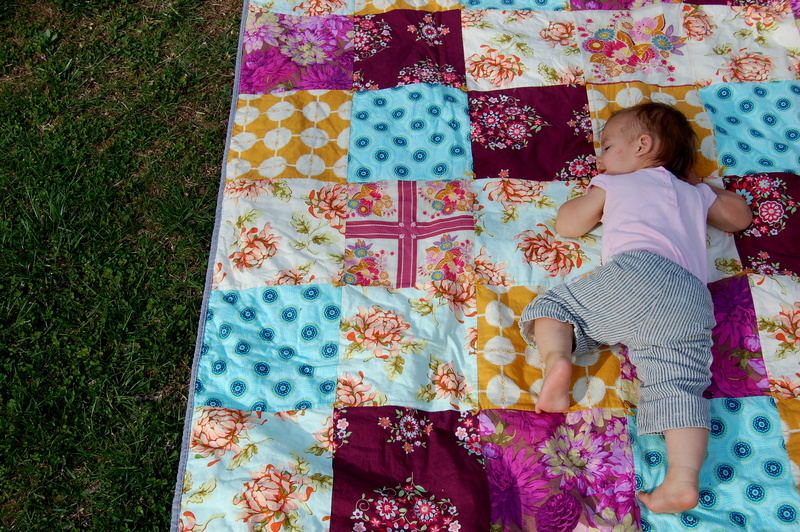 I’ve had the itch to make another quilt ever since finsihing the first one I made last year for Ellery. 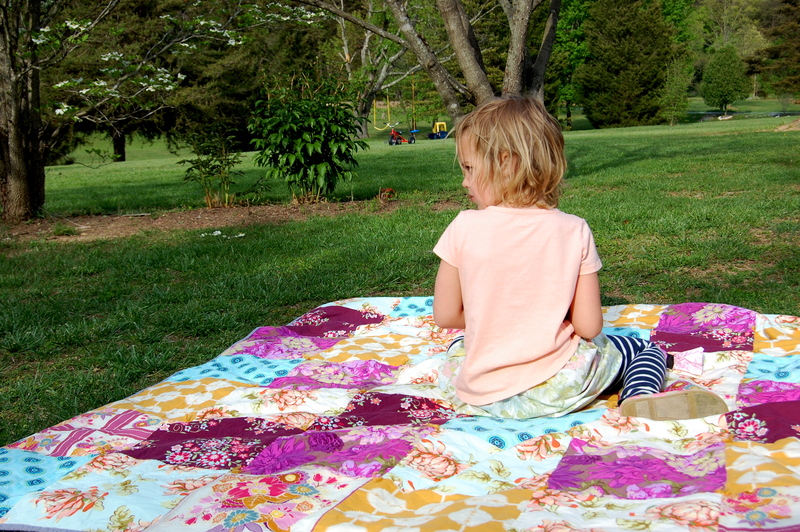 This time, a quilt to hang out on when we are playing outside- which this time of year is pretty much all afternoon. I had a few requirements that I wanted to stick to: It had to be a STASHBUSTER, Colorful (enough to hide food and grass stains), Easy, and fast. 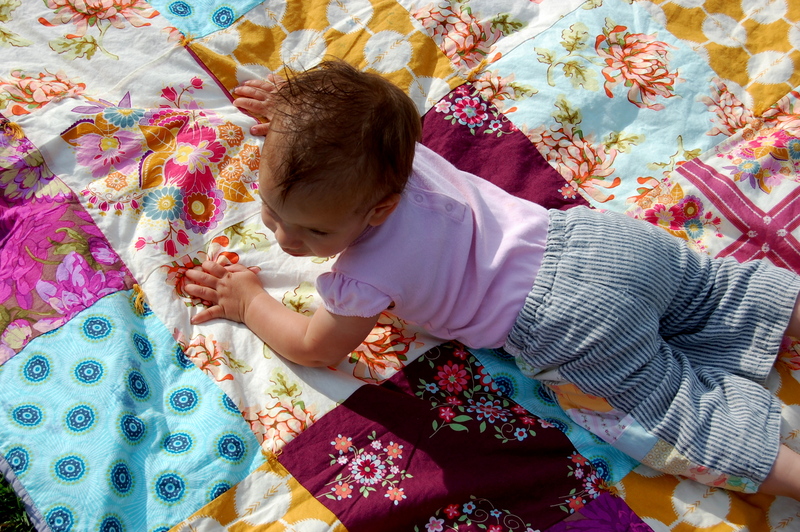 I perused Pinterest, adding several beauties to my quilt board. 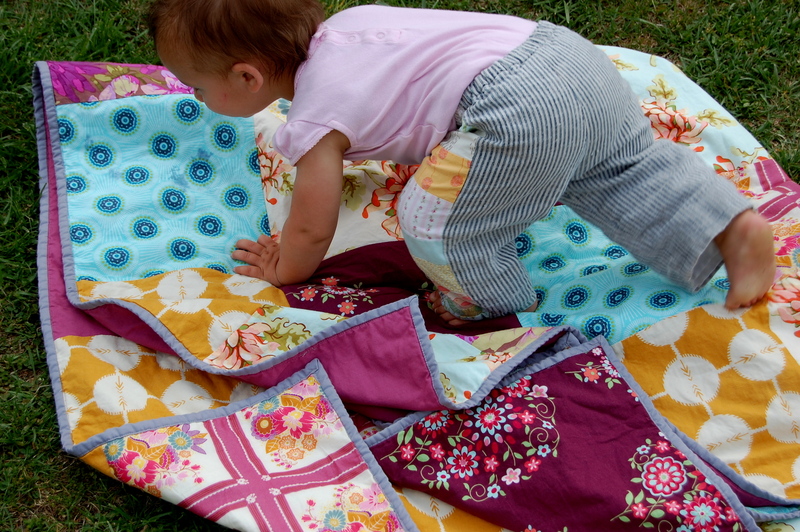 But, I realize I am not a “quilter” and I was putting it off because the whole process was starting to daunt me. Then, I remembered something an old Chef used to tell me in my younger days as a cook… when you get overwhelmed by what’s ahead of you, just use the K.I.S.S. system. As in, “Keep it simple, stupid.” And things will magically come together for you. So I stopped pinning, and started pulling fabrics. I kept going back to the idea of using lots of florals, so I pulled anything I had that jumped out at me. 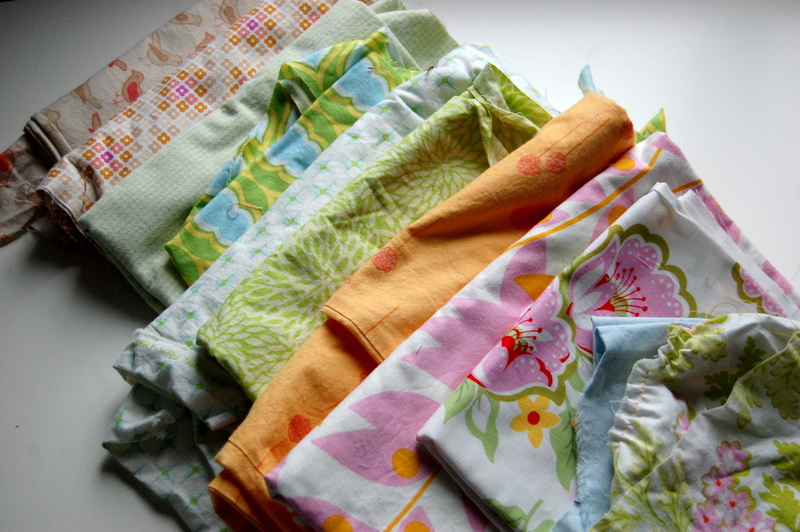 Also, I had a few Anna Maria Horner prints that I felt were just staring at me everytime I opened my fabric closet. Like, “DO SOMETHING WITH US, LADY!”. So, I used a few that I was pretty sure wouldn’t end up into any clothing projects- Coordinates in saffron, and Bubble Burst in Turquoise. I thought those two would break it all up and add some pizazzzzzz…. I cut 10 1/2″ squares. 42 in all. I used my Mom’s square ruler which made the cutting process go super quick and precise. I used Kona in Slate (i think?) for the binding and didn’t waste my nights hand-stitching it on… It was so fast using the machine and a walking foot really helped (again, thank you Mom for that!). 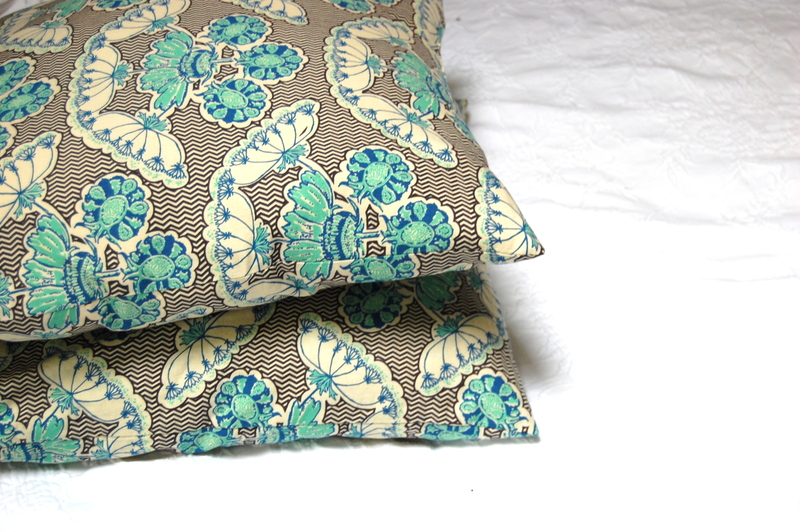 For the backing, I just pieced together any large pieces I had left, plus that green floral print, and also added a large piece of some eggplant-colored cotton. When I asked my Mom if it that was okay to do, she laughed and said “I don’t think the Quilt Police will come after you”. Hey, I don’t know these things! 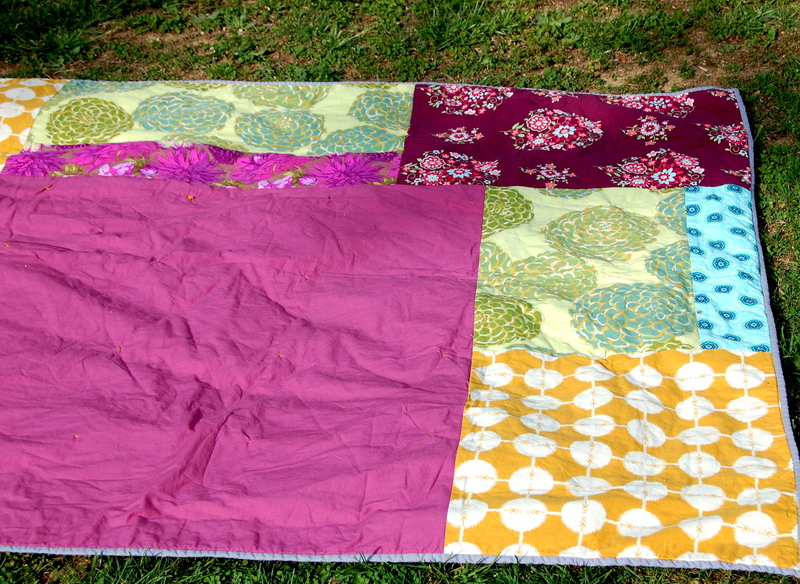 I hand-tied the quilt with mustard colored floss at each corner where the squares meet. I like how sort of loose and soft it is without the stitching all over… In fact, I would probably go that route again- it was so fast and easy. I’m so happy with the result. I am excited to throw it out on the lawn, picnic with the kiddos on it, and maybe even take a nap on it someday. Just kidding. That will NEVER happen. But, I do feel like it’s very “Me”…. whatever that means! 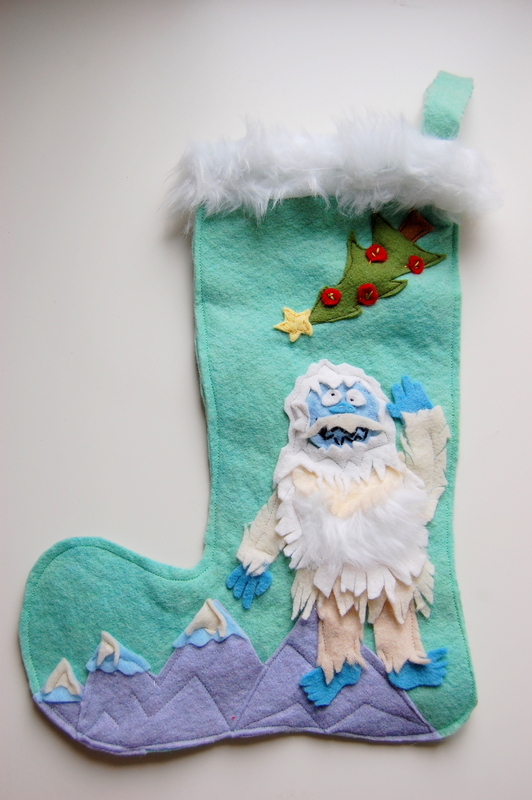 This stocking has been a long time coming… it’s been floating around in my head ever since last year’s Abominable Snowman was created. I know I’m not alone in my love for Clarice…. she is pretty, pure, so kind, and has one of the lovliest voices in show biz. It’s no question that my favorite scene in the Rudolph movie is when Rudolph and Clarice meet… and then when he flies and says “she said i’m cuuuuuuute!” and then his fake nose falls off. It’s classic. I wanted to pay homage to my favorite leading doe, by making this felt stocking for one of my girls (I think Ellery is calling dibs on this one. Corinne will have to settle for Hermie next year! Or the misfit doll maybe?). Do you love Clarice too? Or do you know someone who would appreciate their very own Clarice Christmas stocking? Here’s a step-by-step tutorial for ya…..
First, go here to download and print this little Clarice pattern I drew up. You’ll need wool or wool blend felt. I love the felt I’ve gotten from Ohma in the past- I used it here for Clarice and for the snowy ground… The main part of the stocking is felt from my local fabric shop, Les Fabriques– it’s not quite as high in quality as the Ohma stuff, but it’s perfectly fine for this project, and it came in a large piece. I used Oatmeal-colored felt for Clarice and an off-white felt for the snow. Bright white for the main part of the stocking- but any backround color would be nice here…. I just wanted to keep it mostly white. I also used some little bits of white velour for the white parts on her chest and belly and ears, and some white fur for the fluff on her tail. I used a teensy bit of black felt for her nose, but you can also use a little black craft paint ( which is what i used for the hoofs). Okay, here we go. Cut your pattern pieces out and trace them onto your felt with a disappearing marker, or just get crazy and use a sharpie like me- just make sure to cut away black away. I started putting Clarice’s head together first- I shaped the eye by going back and forth between many photos of her on the iPad. Glue (using basic craft or fabric glue) the white of her eye down to the head piece, and then glue the back part on top of that. Using a few strands of black thread, hand-stitch around her eye…and then stitch a few long eyelashes at the top corner. Her lashes are her best feature, don’t you think? Okay, next glue the little white part of her mouth to her head, and then using a tiny piece of black felt, glue on a little nose for her (or paint one on). I had used her head as a gauge of how big the rest of her body should be… and then made up the rest of my pattern. I think she’s fairly proportionate. Okay, next you need to cut the front piece of your stocking. 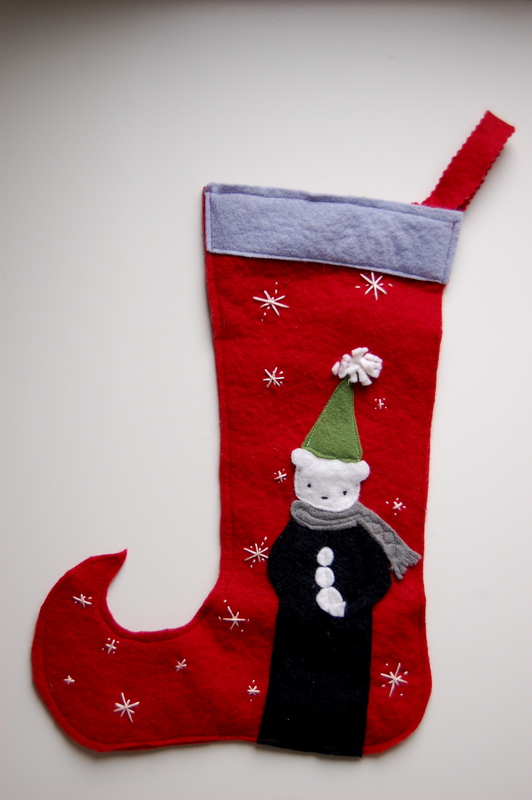 You can trace a stocking you already have, or draw one up freehand. Finished, mine is about 15″ tall, 6″ wide at the center (where Clarice’s body will be), and 10″ wide at the foot. I cut mine slightly larger at first so I had some room to modify the design later on if I wanted to. I used gold thread, but you can barely see it. Oh well…We’ll add some bling later. Using some small pieces of white flannel, felt or velour, glue a bit to her neck, and her belly, and both ears. Just use these pictures as a general guide for that. Then, use a small amount of white fur if you have it to make a little fluff at the end of her tail. You could probably even use a little bit of a cotton ball if you didn’t have fur. Check out what my kiddos did to my embroidery floss while I was engrossed in my project!! ARGH! Next, you can sew in some snowflakes using a few strands of thread- I used metallic gold… yep, you heard me. Gold snow. Er…stars? You can also use embroidery floss. Make a cross going one way, then a smaller one going the other way. Make as many or as few as you want. Next up, pin your stocking to your back piece of felt. 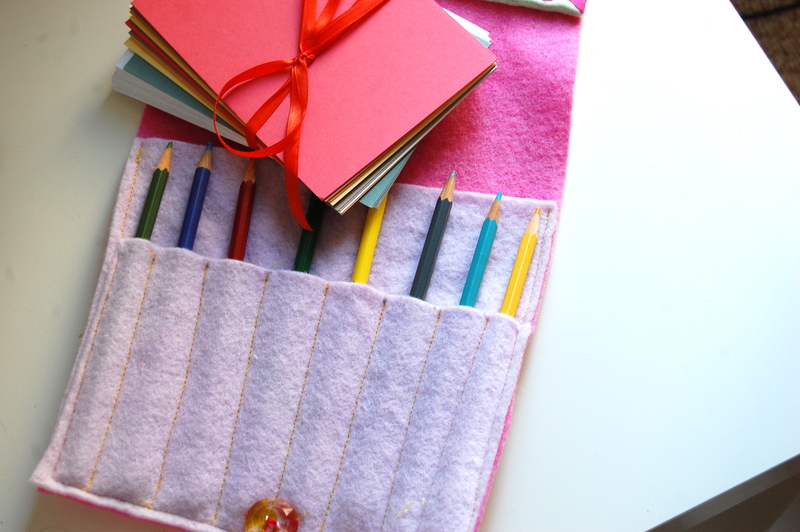 Sew your stocking together, staying close to the edge of your design. Stitch along the marking on the foot you made, and then cut away the excess…. Bring the ends together and hand stitch them to the back piece of your stocking, at the top right corner. Hand-sew your trim (beginning at the back somewhere) all around the top edge of your stocking. And enjoy having “There’s always tomorrow…. ” stuck in you head for about 3 days after…. There may have been a shortage of blogging last month, but certainly no shortage of things made. 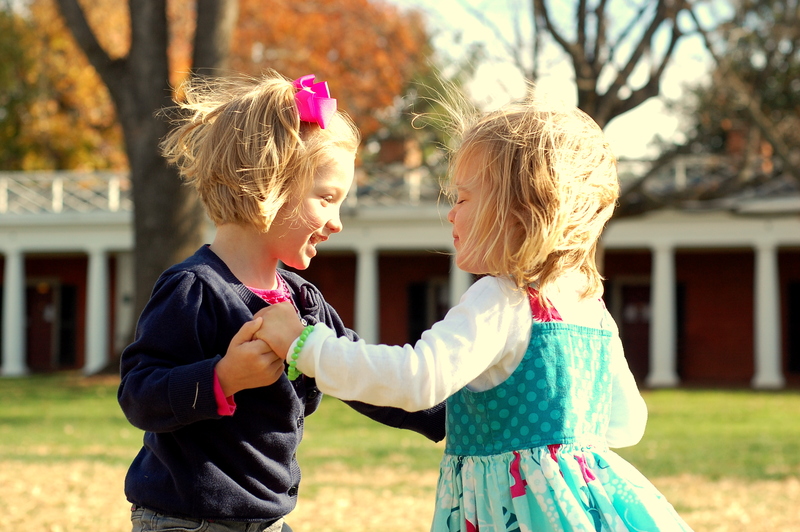 Ellery’s BFF “friend Caroline” and her nothing-short-of-amazing mother, moved all the way to Colorado. We are so sad they moved away but wish them all the best and promise to skype as much as possible! I suggested to Ellery that we make Caroline some stationary so she can write letters to us. It didn’t feel like *enough* though, for such a dear friend… I mean, we’re crafters, aren’t we? 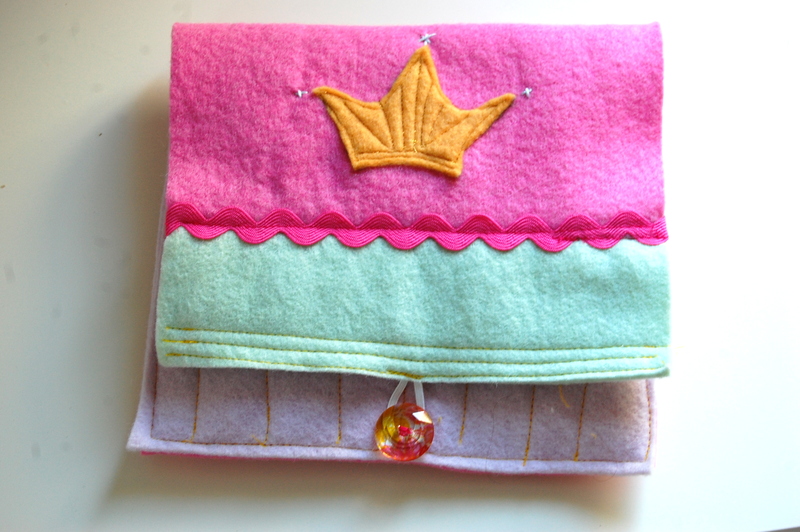 So, we whipped up a little felt case (i get my felt from Ohma) in no time. We didn’t measure anything, just cut from random pieces in my stash. Caroline and Ellery loooove princesses, so we made a little crown for the front- stitched with gold thread, and some silver embroidery floss knots for a little bling. Ellery sat on my lap the entire time and helped me keep my lines straight ;)… I love how this has a 4 year old touch. On the way to Caroline’s house, we stopped and got some special twistable colored pencils (not shown)- perfect for her…she is a fabulous artiste! 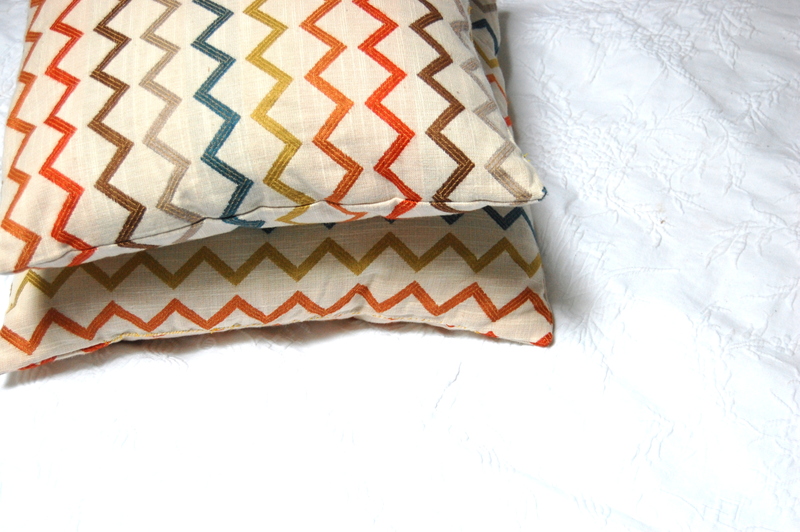 I made some couch pillows…. 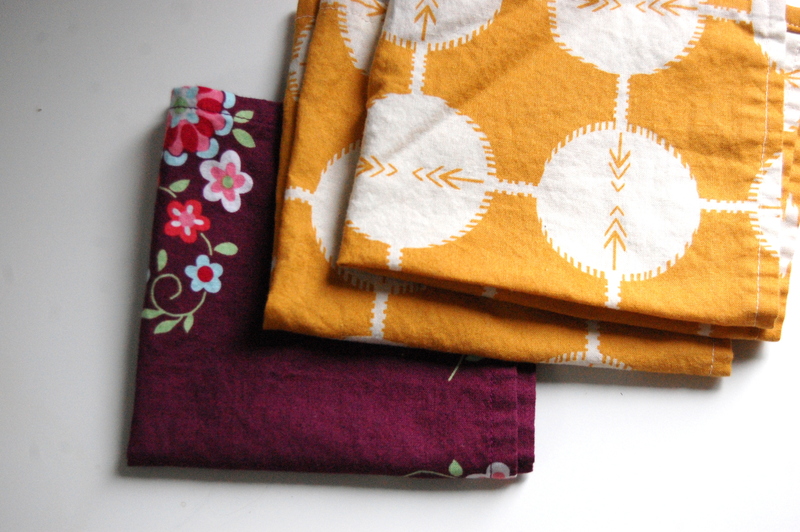 Finally got around to sewing up some cloth napkins. I’m 32. It’s time I stopped using paper towels at every meal. This ruffle-less Pierrot with elastic casings in the sleeves (previous pierrots here and here) came off as quickly as it went on. I dunno…. maybe the mustard lining threw her off??? 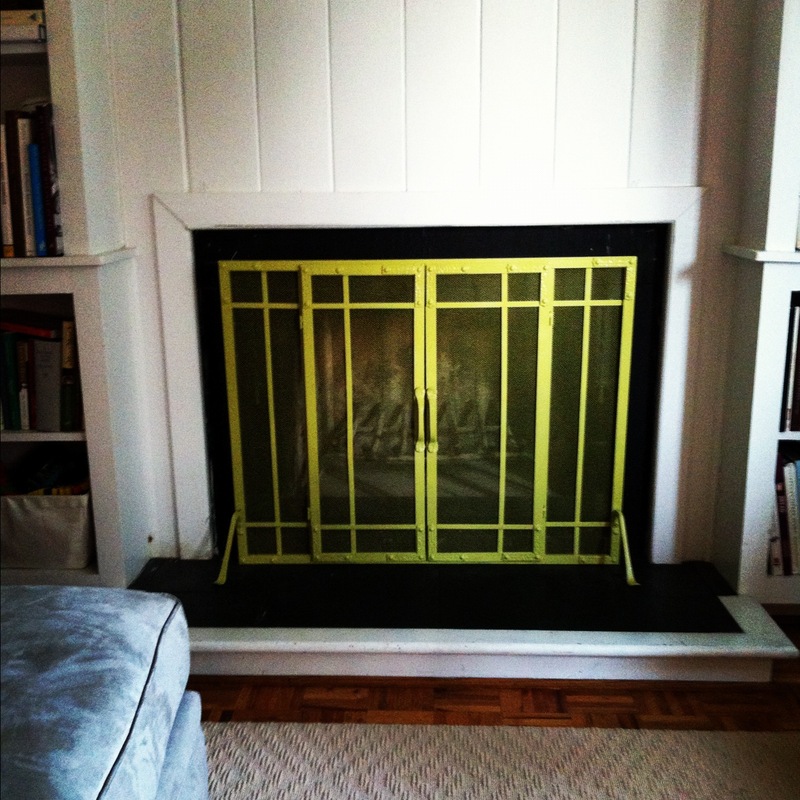 And finally, I got this crazy notion to spray paint my fireplace screen yellow, but when I got to Lowe’s, Avocado spoke to me. So, there you have it… you can spray paint over spray paint, right? 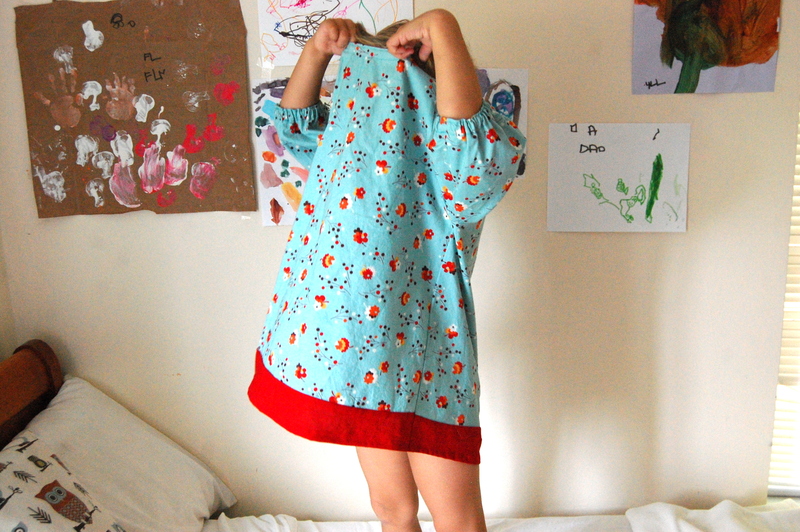 Gotta say I’m a little bummed that E won’t wear my dresses…. 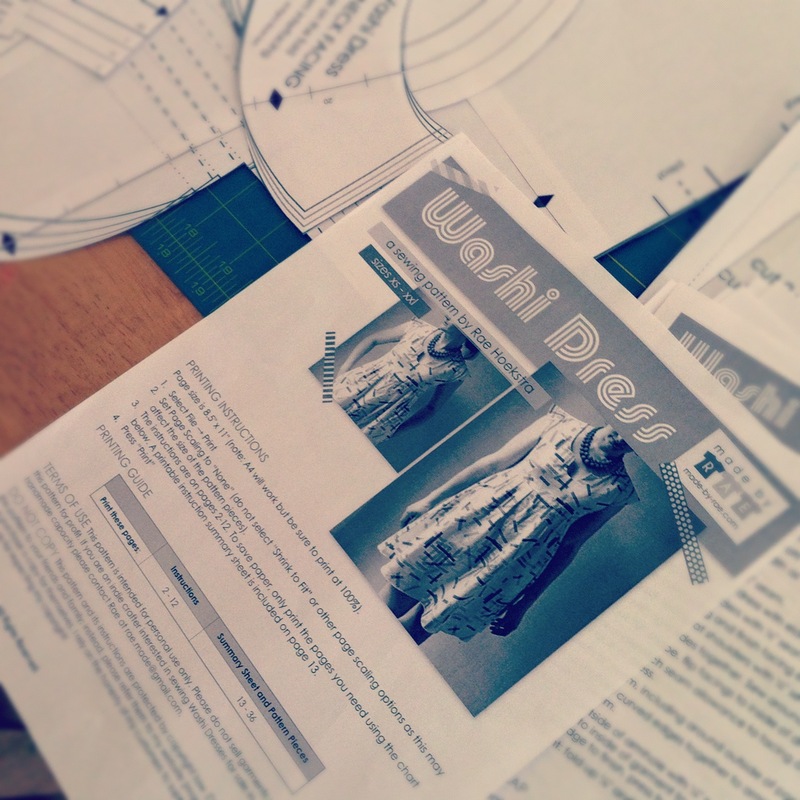 So, for a while I’m going to concentrate on sewing for ME! 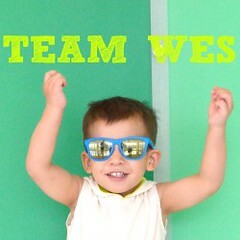 “Baby Sean” turns one in a couple weeks. And, when our sister Erika said she was going to buy birthday flags on Etsy for $35, I volunteered to whip her up a set at cost. I’m all for supporting Etsy and everything (check out our mom’s new shop! ), but when it comes to something this simple, ya might as well make your own. 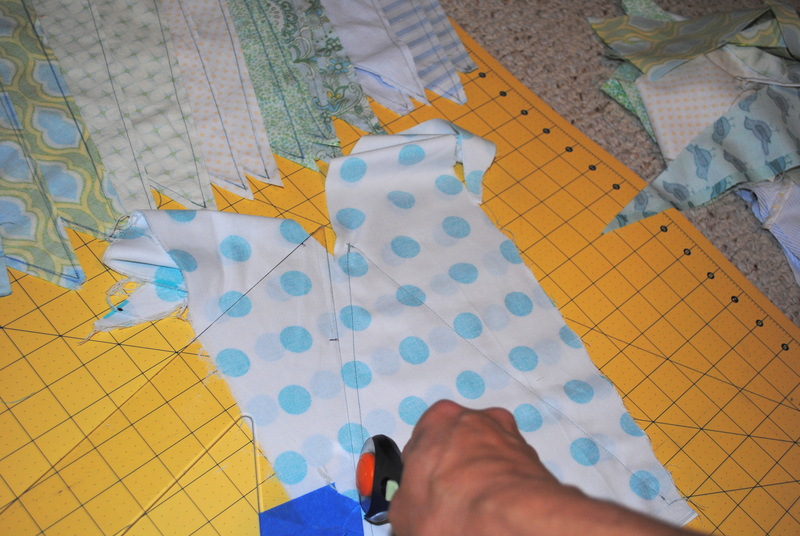 This tutorial is for the beginner seam-sters out there. Just a few years ago, this was one of my first sewing projects. 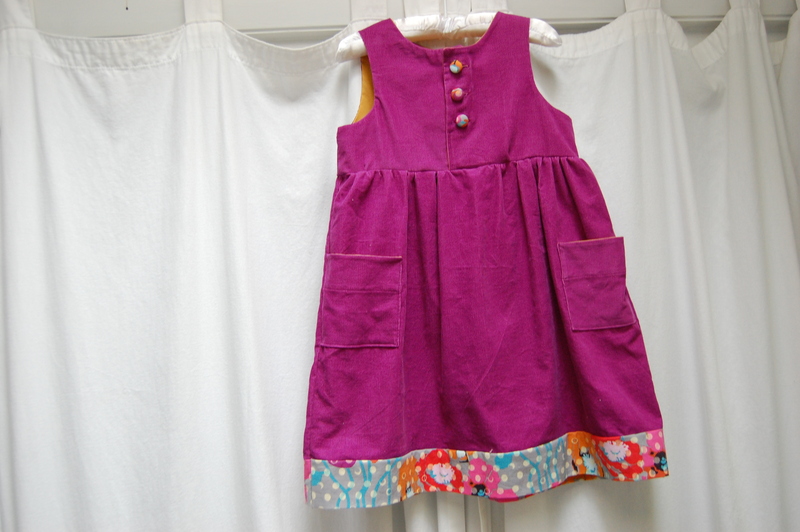 It’s a great skill builder, and allows for you to make use of bit pieces of favorite fabric. Also, if your kids are like mine, they will feel super special each year when their birthday (or week) is recognized with a sweet family tradition. 1. Select your fabrics. Go crazy! 2. 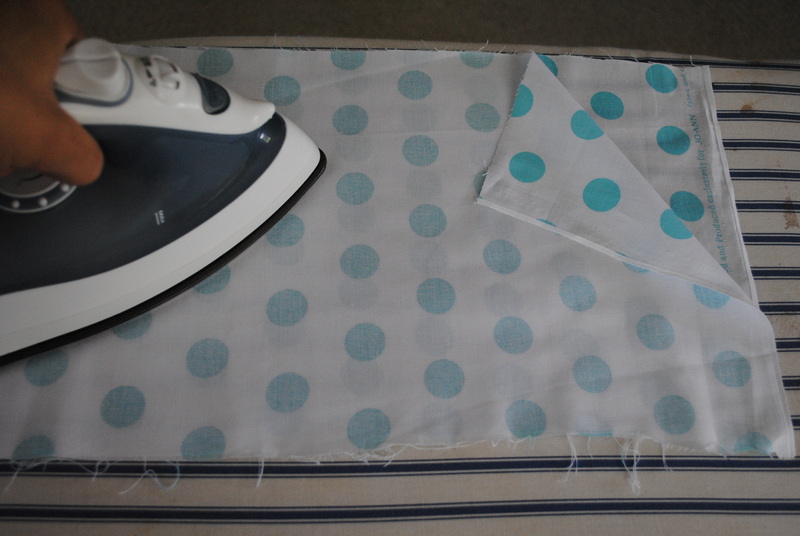 Fold your fabric pieces in half, right sides together, and press. 3. Draw and cut an isosceles triangle (2 sides equal length, middle school math anyone?) out of cardboard. Or, if you have a random, giant, see-through, plastic triangle like mine, by all means use it. Where did I get this thing? It just turned up one day and I use it all the time. Quilters probably have buckets of these. 4. 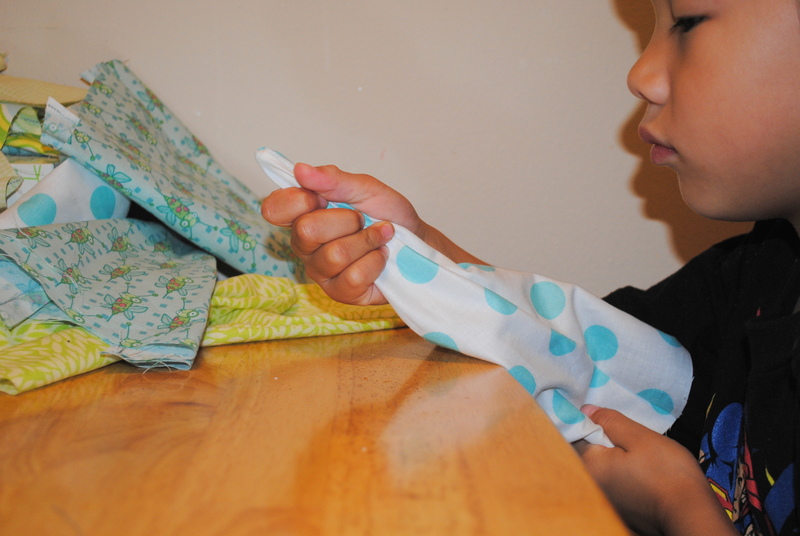 Trace your triangle onto your folded fabric, however it fits nicely. 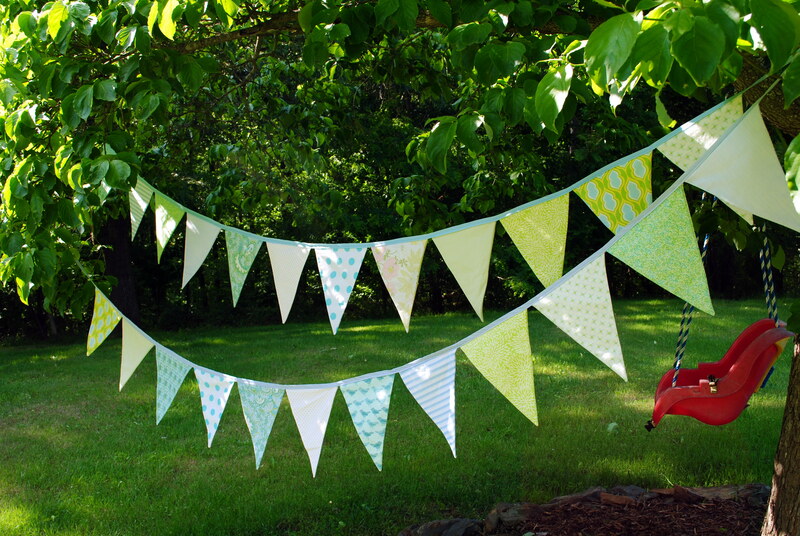 I decided to cut two triangles out of each piece, for an extra set of bunting (now I have a ready-made gift stashed away for future giving). 5. Tip from Mom: Do not cut your triangle out yet. SEW FIRST! Luckily my mom stopped by while I was starting this project. This tip was crucial. I didn’t have to worry about my pointy flag tip getting sucked under like a toga party on an escalator! Sew along the two equal sides, reinforcing stitches at the tip. 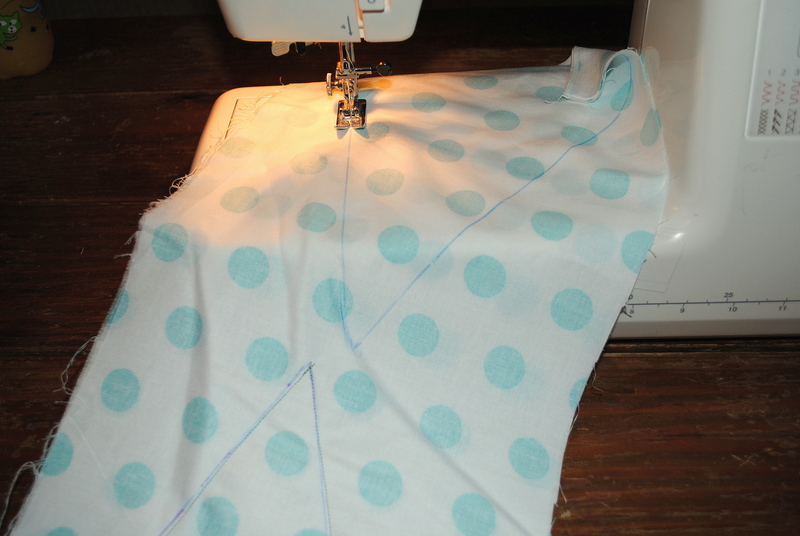 Don’t bother sewing across the top of your triangle, as that is where you will turn your fabric. 6. 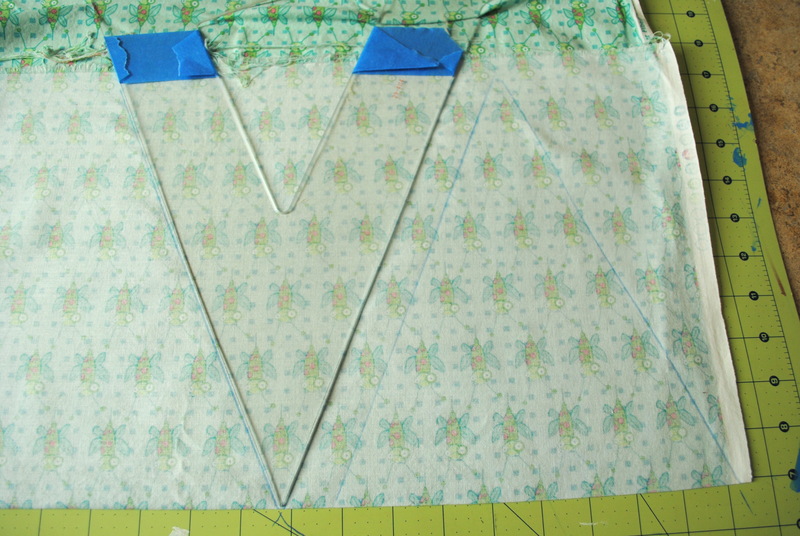 Cut out your triangles, about 1/4 of an inch around the stitching. Cut closer to stitching as you near the point. 7. Turn your triangles right side out. Use a knitting needle or chopstick to get at your point. Children may enjoy helping with this task! 8. 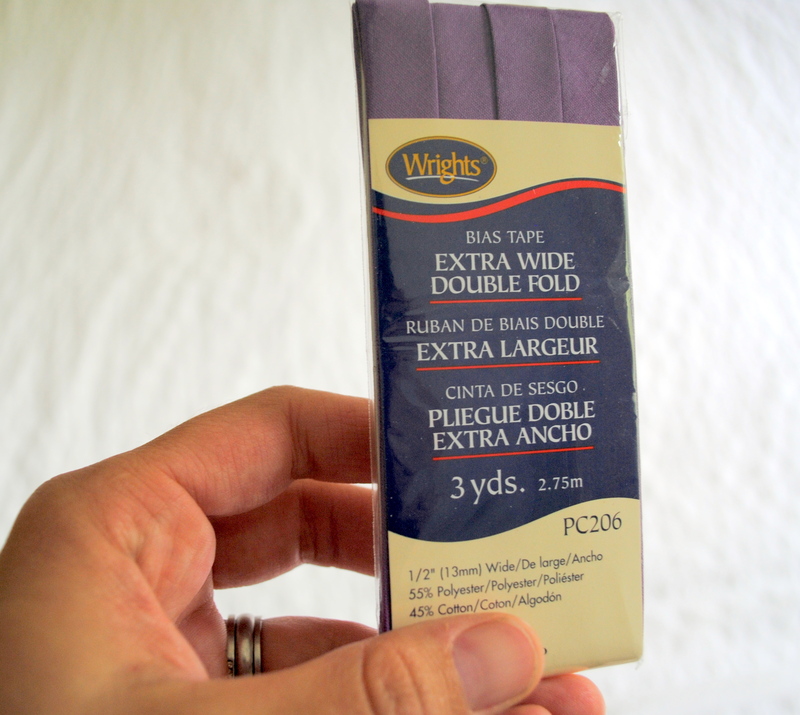 I forgot to tell you, buy some coordinating double-fold bias tape. 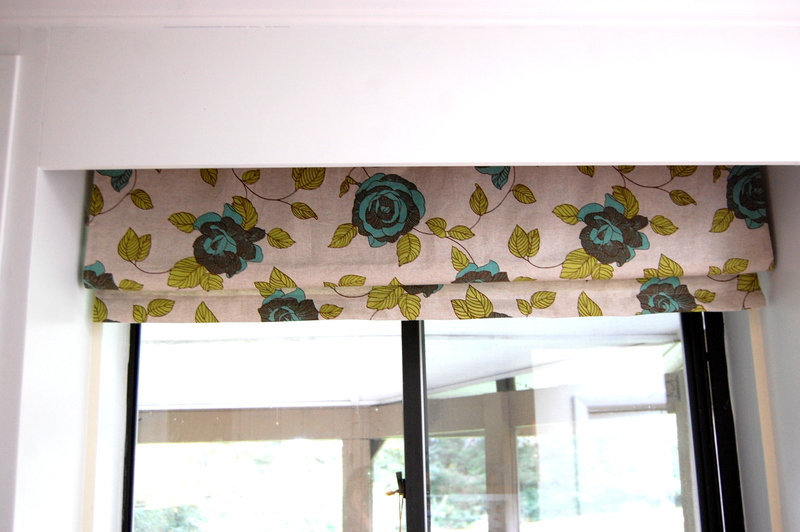 Or make your own, you do not need to cut your fabric on the bias. 9. 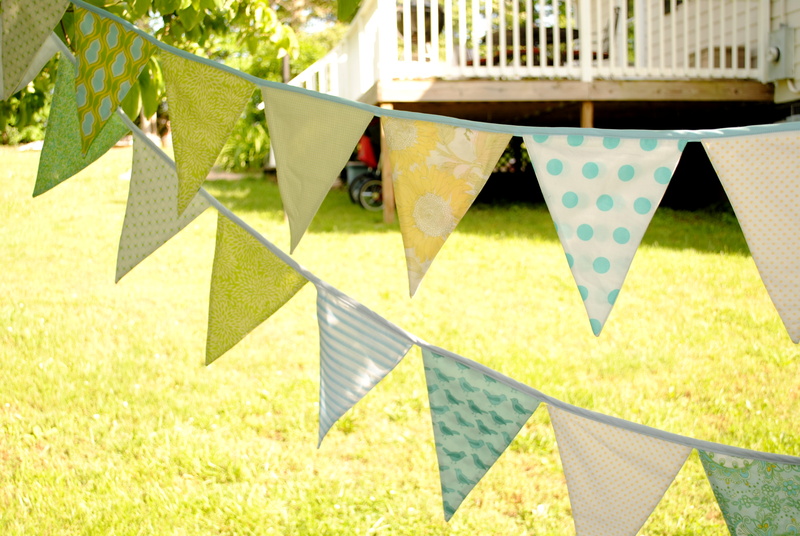 Press your flags, trim the tops so that they are nice and straight and matched up. 10. Order your triangles how you like. Lay them out to see how they will fit along the bias tape. 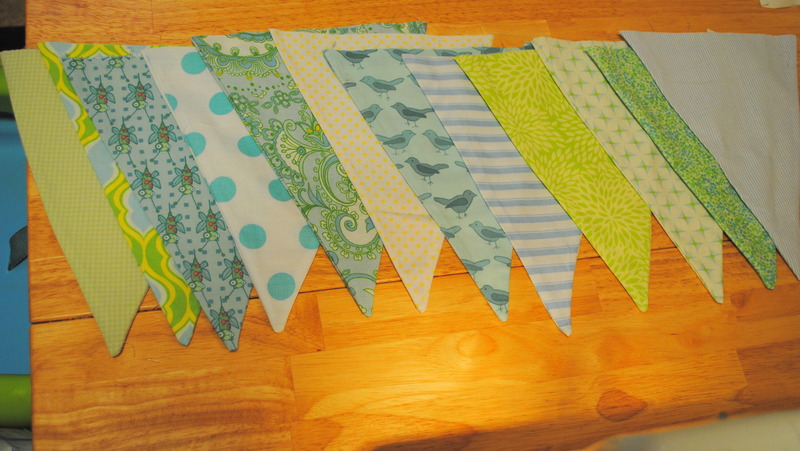 I used 12 flags per 3 yard bias tape. 11. 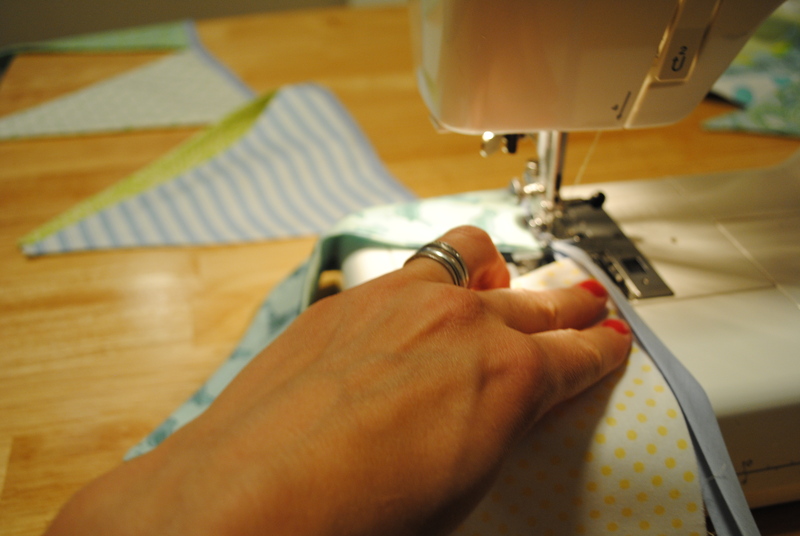 Open up your bias tape and shove the open end of your triangle to the top of the main fold. You are welcome to use pins, but I think it is best to just go one flag at a time, holding it in there a bit as you run it through the machine, about 1/8″ from the bottom edge of the tape. My husband called me one day from work to tell me that they were having an employee furniture sale- (he’s the executive chef of a 48-room hotel here in Charlottesville that was once the home of (now deceased) Sir Bernard Ashley- as in the husband of the late fabric designer Laura Ashley). When Sir Ashley sold the home in 1999, all of the furniture and decor was included- I’ve heard that at the time it was decked out in Laura Ashley everything… curtains, wallpaper, bedding, you name it. So you can imagine, there are lots of treasures tucked away in the attic of hotel today. Anyway, the hotel decided to clear up some space by selling some furniture that didn’t really have a place anymore. So Dean called with a few things he thought we’d like, and though it was hard to give the go-ahead without seeing everything, I knew he’d do me proud. We scored 2 beautiful vintage wooden sleigh beds for $15 each, and a great old white desk for $30 (which has now become my spacious sewing table). Seriously good deal if you ask me- good job Deano! I wonder if they actually belonged to the Ashleys or if that’s something I just like to daydream about since it sounds cool… hmmm. 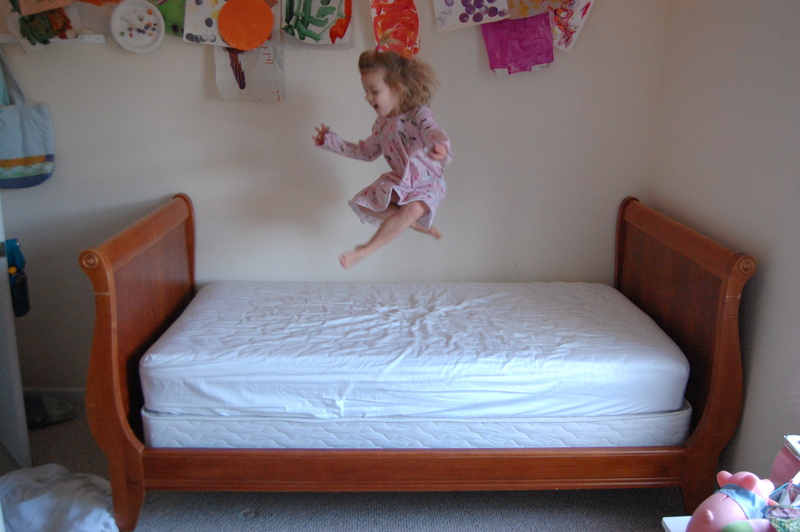 We finally set one of the beds up in Ellery’s room yesterday. She calls it her ‘Princess Bed’ :). Hey, whatever keeps her in it at night, right?! Ah… don’t even make me get into it…. 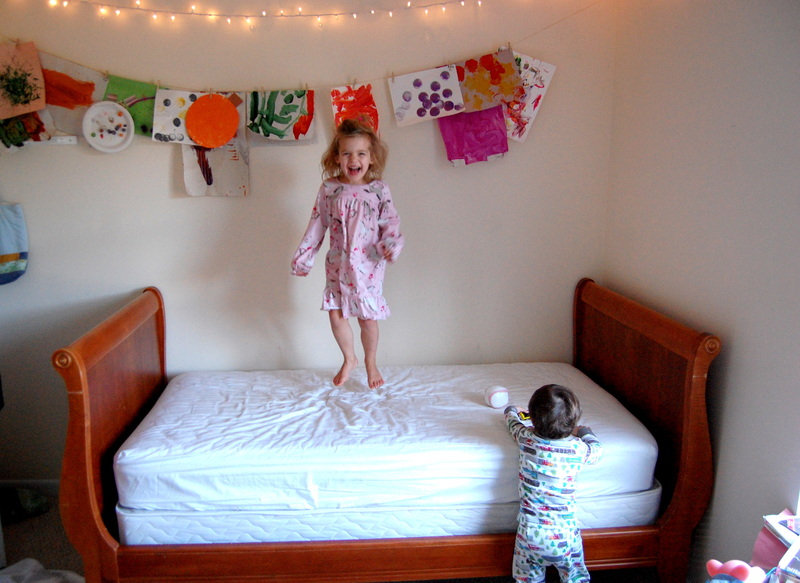 So, for such a special bed, I decided this princess deserves a new bedspread… A quilt to be exact. Made by… a-hem…ME. So, I’m holding myself to it. I’ve got a lot of scraps lying around- I’m going to make a Chinese-coin quilt, which I can use lots of little squares and rectangles for…. and then lots of white to break it up and keep it clean looking. Plus, it’s an easy enough design for me to (hopefully) not screw up. I’m happy with my color-scheme, especially since it reminds me of springtime- which is when my sweet girl was born. I’ll post my progress as I go. Wish me luck- I have no idea what I’m doing! Felt might be my favorite material to work with. I bought some good quality felt a couple years ago from OhMa Felt– it’s a big difference working with quality wool felt, and say, the stuff you find at Michael’s… Another book that I LOVE is Kata Golda’s book. Check it out if you like felt! Onto Grant’s stocking… I got so into this project, you have no idea. I spent some time googling images of my favorite Christmas character, the Abominable Snowman and just went at it piecing together scraps of white felt and some faux fur for his belly. He’s just the right mix of scary and cute I think! I might make a couple more for me and Dean, but I need some suggestions… Rudolph and Clarice maybe?